Ole picked me up at the airport and we had lunch at Humpy's in downtown Anchorage. I couldn't help but wonder, "Are there any microbreweries in Anchorage?" I was asking the right person. No more than two hours in Alaska and I'm enjoying a nice glass of ale at the Snow Goose. Did I mention that Ole's also a runner? One of the fast guys, in fact. Anyway, every Thursday there's an all-comers track meet, and it just happened to be Thursday. What's a guy to do? This week's festivities included a 5K race on the track, which I entered, thinking there might be quite a few people running. Nope. Only five. I finished in my fastest time in nearly four years, 25:19, having been lapped three times by two young fast guys and twice by Ole and one other guy. I figured I had finished DFL, but later that evening I found out that one of the two kids decided he couldn't hold the pace and dropped out. So, I was out of the basement with a fourth place finish! Summer solstice was upon us, so during my stay in Alaska I didn't experience any darkness. I guess there was some for a few minutes in the middle of the night, but I must have slept through it. Friday was the designated rest day before the marathon. 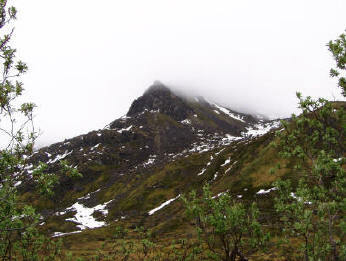 We got in Ole's Jeep and headed for Hatcher Pass, north of Anchorage. After two hours of paved roads, we turned off the beaten path and onto a long-neglected two-track. As the weather turned from pleasantly overcast to a light, foggy rain, we explored a box canyon, rimmed with the remnants of long abandoned goldmines. 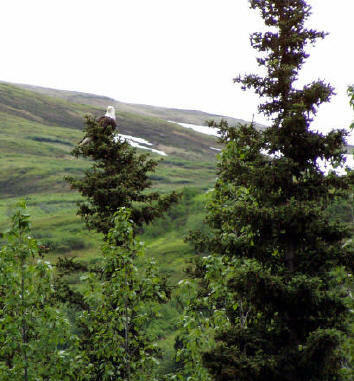 It was here that I got my first look of a bald eagle in the wild. As we jostled over the rocky road little parky squirrels darted out, running ahead of the jeep, keeping ahead of us for a few yards before ducking back into the bushes. We drove as far into the canyon as Ole would go unaccompanied by a second jeep. The nearest road service would be a two-hour hike out to the first working telephone, then a several hour wait. We headed back out of the canyon and further north to Talkeetna. 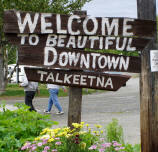 Talkeetna is the starting point for many Alaskan adventures, including climbing Mt. McKinley. The downtown area is filled with arts and crafts and lots of tourist shops. Marathon day, Saturday, was a beautiful Alaska day. Ole drove me to the marathon start, and stayed around until we started running. He would run the half-marathon an hour later. The crowd was a sea of purple, as the Leukemia Team In Training uses this as one of their incentive marathons. I would guess that over half of the field was doing their first marathon. We started out on streets that were too narrow to accommodate the crowd and soon were crowding onto a paved bike path that was even narrower. But we were all friends, so the slightly-too-close feeling wasn't that bad. A young group of soldiers was doing double time, keeping a cadence up for the first two miles as they ran in formation. A couple more pain killers helped some, but by about 20 miles my ankle was throbbing. Oh well, only six more to go. I managed to find a few people with whom I'd been running back and forth, and worked on encouraging them. A couple of the Army kids were working real hard to get through this, and I would pass them repeatedly as they ran, then stopped to rest. Mile 25 finally arrived as we skirted a lake in a downtown park. The final joke on the runners comes about halfway through the 26th mile, as we start up a hill, the top of which isn't visible until you make several turns. It's one of those fun-yet-cruel hills that taunts you as you wonder how far up it could possibly go. Finally, however, we flattened out, just in time for the 26 mile mark and the final sprint to the finish. Then the really enjoyable pain started, as I took off my shoes and soaked in one of the wading pools full of ice water. State #36 was in the record books. My plan was to go fishing in Alaska - another event on my life list. With a screwed-up ankle, however, the fishing thing was out of the question for Sunday. Instead, Ole and I joined some of his friends on a train trip to Seward. The Alaskan wilderness provided us no end of beautiful scenery--mountain sheep, bald eagles and moose against a backdrop of mountains and glaciers. Monday was a kick-back day to do a little shopping, hike some of the local trails, and watch a video before heading off to the airport. 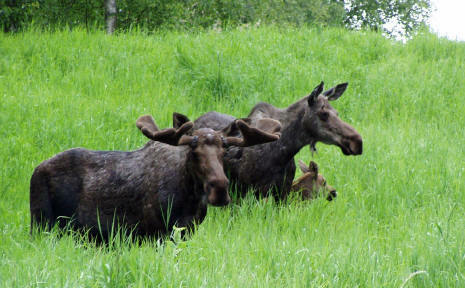 Again, my host seemed to know exactly to find the good places--as we drove around the back side of the airport, we got a great look at three moose, then another one who was just wandering down the bike path. Many of the Team In Training first timers were at the airport. ALL of them were excited about the marathon experience, and most were making plans for their next one already. I was excited about it too. My 36th state, 69th marathon, and a great weekend in Alaska were in the record book. Damn! Now I have to go back for that fishing trip.